Writing an essay introduction is one of the most important steps in crafting a great paper. You have to capture the reader’s attention with your opening salvo and deliver your thesis statement. The three keys to writing a great introduction are: 1) use a hook, 2) provide a little background info, and 3) state your thesis—the main idea that will be supported by the body of the essay. In this article, we’ll show you how to write an essay introduction and give you some good examples of intros that can be used for a variety of essay genres. Always start your essay off with a hook. The hook will be the first one or two lines of your intro. Depending on the type of essay you’re writing, it will vary in terms of tone and style. “Holy cow!” I hollered as a lifted myself off the ground and saw the glittering objects all around me through the swirling dust of the cellar. According to the latest figures, the number of pizzas consumed per year by people in the U.S. currently sits at 3 billion. To put that into perspective—that means approximately 350 slices of pizza are being eaten every second in America. The hook is your way of catching the reader’s attention. Once you have it, you can start adding to the intro by developing the theme that will lead the reader to your main idea. Is it any wonder that obesity is an epidemic, as Gussone (2007) points out? The fact is that Americans are consuming more food and more unhealthy food than their bodies are able to process: “one in five adolescents, ages 12–19; one in five kids, ages 6–11, and one in ten preschoolers, ages 2–5 are considered obese, not just overweight” (Gussone, 2007). This essay will show how, in spite of what some say about fat shaming and body image, the fact is that obesity is a problem of epidemic proportions and is causing a catastrophic health issue for people in America. According to the latest figures, the number of pizzas consumed per year by people in the U.S. currently sits at 3 billion. To put that into perspective—that means approximately 350 slices of pizza are being eaten every second in America. Is it any wonder that obesity is an epidemic, as Gussone (2007) points out? The fact is that Americans are consuming more food and more unhealthy food than their bodies are able to process: “one in five adolescents, ages 12–19; one in five kids, ages 6–11, and one in ten preschoolers, ages 2–5 are considered obese, not just overweight” (Gussone, 2007). This essay will show how, in spite of what some say about fat shaming and body image, the fact is that obesity is a problem of epidemic proportions and is causing a catastrophic health issue for people in America. So what makes this essay introduction work? It’s five sentences long, contains a good hook that gets the reader’s attention with a fun fact; it then leaps into the background of the subject you will be exploring (obesity), and concludes with a statement of your purpose—your thesis. It is succinct, informational, and direct. It identifies the problem you intend to address and how you are going to go about it. Based on this introduction, the rest of your essay should focus on linking obesity to health problems and showing why obesity is not just a social construct but an actual issue that stems from poor diet and lack of exercise. The best essay introductions will be those that fit the style of the essay genre in which you are writing. Determine whether your essay is expository, descriptive, narrative, or argumentative. If your essay is expository, make your introduction more fact-based. Summarize the background information in your intro in a way that brings the most important facts forward. A good essay introduction for an expository paper will be information-based and may include a couple of brief references to show that your essay’s claims are verifiable. If your essay is descriptive, your introduction will focus on providing the right context for whatever it is you plan to describe. You can start off this type of essay by posing a question and answering it in the intro. A good descriptive essay intro will use strong sense words that appeal to the five senses—so be sure to think about how the subject sounds, looks, tastes, feels, and smells. If your essay genre is narrative, your introduction should establish your point of view. Let the reader know whose perspective this narrative is coming from. A bit of dialogue can be used as your hook to help draw in the reader. The intro should go on to set the stage and it should close out by giving the reader an idea of what the rest of the essay will be about. If your essay is argumentative, consider posing a question or using an anecdote to hook the reader in the introduction. An anecdote is a very brief story that can help to frame the problem that you will be addressing. For instance, if your argument is that government subsidization of health treatments actually makes it harder for people to receive preventive care, tell a brief anecdote that highlights this problem and then state your thesis. Bad essay introductions make at least one of three mistakes: 1) they fail to catch the reader’s attention, 2) they fail to identify the main purpose or direction of the essay, and 3) they fail to connect in any meaningful way to the body of the essay. In other words, they are completely superfluous and unnecessary. The essay introduction should be succinct—5 to 7 sentences are usually sufficient to do the job. The intro should get the reader’s attention, set up the rest of the essay by identifying the thesis, and should be related to what follows. If your essay is about transformational leadership, it would be pointless to have an essay introduction that discusses the Global Economic Crisis (GEC) of 2007. Unless you can in some succinct way link the GEC to your topic, there is no reason to even bring it up in your intro. Bad essay introductions fail to stick to the three main points needed to make an intro successful. The best way to learn how to write an essay introduction is by way of example. That’s why we offer students 100% customized-models for all their essay-writing needs. Whether you are looking for an introduction, a literature review, analysis, outline, proposal or a research-based model essay, we are always able to provide you with an excellent example of how we would do it if we were given your parameters. See here for rates and answers to FAQs. Why is the drinking age limit still at 21? In the U.S., you have the right to vote at age 18. You can join the military and sacrifice your life on the battlefield at the same age. Yet, if you want to consume alcohol, you have to wait another 3 years to do so. Meanwhile, in other parts of the world, drinking wine or beer is a part of life for families, and young people are raised to treat alcohol as a natural and healthy accessory to meals and socializing. In the U.S., we treat alcohol as though it were dangerous: our teetotaler ancestors and the Prohibition mentality of the 1920s still reign. However, as this paper will show, responsibility and moderation can both be better effected by lowering the drinking age limit and promoting a culture in which the taboo of drinking is eliminated altogether. In 1913 the Federal Reserve was established. Its mission was to help ensure the stability and integrity of the American monetary and financial system. However, in 1933, the U.S. abandoned the gold standard, meaning citizens could no longer trade in their dollars (aka Federal Reserve notes) for gold, though foreign governments still could. In 1971, Nixon ended even the latter. To create demand for dollars, the Petrodollar was system was established in 1974, whereby in exchange for selling oil (the world’s largest commodity) in USD, Saudi Arabia would receive military equipment and protection from the U.S. Today, that system is being threatened on multiple fronts—from the rise of cryptocurrencies to the introduction of the gold-backed yuan oil futures contract. In short, the USD’s days of dominance are numbered. Whether one likes it or not, America is a Fast Food Nation. As such, the dining connoisseurs of today must appreciate the subtle differences among the various fast food joints in order to ensure relevance. Two big competitors in the fast food service industry today are Chipotle and Subway. The latter has been around for a few decades in most regions of the U.S. Chipotle is still a relative newcomer, though it arrived with a whirlwind that sent its stock price soaring. Both chains have, however, fallen on harder times in recent years, with Chipotle receiving a barrage of bad press related to hygiene and Subway falling out of favor with a public more and more interested in authentic cuisine. This paper will compare and contrast the two restaurants and show why in today’s fast food culture, Chipotle still maintains the upper hand. The electric car has received a lot of attention in the news in recent years. Tesla has been touted as the car manufacturer of the future because of its battery-powered automobiles which cater to the demands of green consumers. Yet, green energy is not always what it seems. The batteries that power Tesla’s cars, for instance, mostly get their energy from fossil fuels—not from green energy producers, such as windmills or solar panels. What makes green energy green, and what is the difference between green energy and fossil fuel energy? This paper will compare and contrast the two types of energy and show how even though it might appear green once it hits the retail shelves, it is not always green at conception. Kevin came from a broken home. He did not do well in school, had few friends, and fell afoul of the law early on in life. When he was fifteen, he entered high school. Few expected him to succeed and many anticipated that he would drop out once he turned sixteen. However, when Kevin met Mr. Daniels, everything changed. Daniels’ approach to education was different from any other teacher that Kevin had had up to that point. Daniels believed that character education was the most important focus that a teacher could take in the classroom—and for that reason, in Mr. Daniels’ class Kevin began to get an education in character. Kevin’s grades improved. He started taking his studies seriously. He started making new friends, and he even got a job. After four years, Kevin graduated high school at the top of his class. When asked what led to his transformation, he said two words: “Mr. Daniels.” This paper will show how and why character education is so important in today’s school system. One of the most important theories to emerge in the field of criminal justice is the concept of Broken Windows. Broken Windows Theory holds that if a neighborhood allows itself to decline in terms of appearance, it enters upon a slippery slope that ultimately ends with high rates of crime and drug use. In other words, if a neighborhood does not care enough to take care of vandalism and graffiti, it will be apparent to the criminal element that they can come in and take over. Broken Windows Theory is, therefore, crucial to understanding how communities decline and become havens for criminals. This paper will prove that if a neighborhood fails to take care of itself and fix its “broken windows,” it has only itself to blame when the crime rate escalates. Dostoevsky had always wanted to be a writer—but it was his time in prison that really helped make him into the great Russian writer that he became. There he finally obtained a real sense of humanity, and there his spiritual sense began to be deepened as well. In fact, the transformation really began when he and his friends were marched out to be executed. It was then that Dostoevsky felt certain that he was going to die. When the reprieve came at the very last second, it was like he was given a new chance at life—one that he would be ever grateful for. First, however, he had to endure several years in a prison in exile. The essay introduction is very important to the success of any kind of essay no matter the genre. It is the place where the main idea of the essay is expressed and the place where the writer gets to hook the reader’s attention. It is also where a little background information on the main topic of the paper can be presented—usually in between the hook and the thesis statement. Every essay needs an introduction—so here is the best thing to do with yours: use it to introduce your topic, but do so in a way that catches the reader’s attention. Use a fact or statistic to highlight an important point that will allow you to build towards your argument. Use an anecdote to frame your essay by a particular experience. Or pose a question: start off your introduction by asking the reader to think about a certain idea that you can then expound upon in your paper. 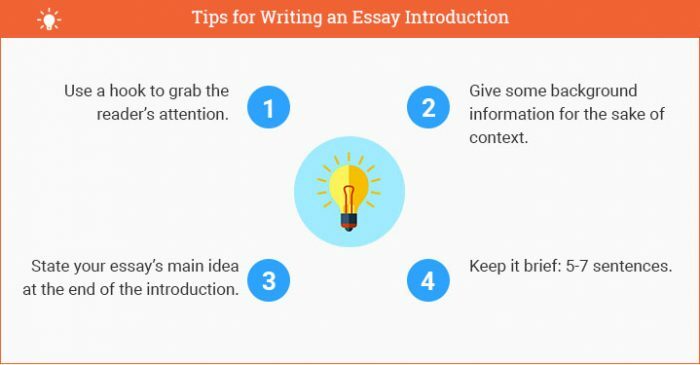 There is no one way to write an essay introduction so just remember the three main points of the intro: 1) catch the reader’s attention, 2) give the reader some background info on the subject you will be exploring, and 3) state your thesis—i.e., the main idea of your paper and what you will be discussing in the coming pages. If you found this tutorial helpful, don’t hesitate to try out our model essay writing service to get an example that meets your needs. Use a hook to grab the reader’s attention. Give some background information for the sake of context. State your essay’s main idea at the end of the introduction. Keep it brief: 5-7 sentences. "How to Write an Essay Introduction (Quick and Easy)." Aceyourpaper.com. Student Network Resources Inc, 29 December. 2017. Web. 20 April 2019. Student Network Resources Inc. "How to Write an Essay Introduction (Quick and Easy)." Aceyourpaper.com. https://www.aceyourpaper.com/essay-writing/essay-introduction/ (accessed April 20, 2019).